From unique wine experiences to traditional harvest festivals to world-class art and culture events, there’s something to suit everyone on Sonoma’s annual calendar. Here are 15 yearly highlights not to miss, ordered from January through December. From corkage-free fine-dining to exclusive prix fixe meals to discounts on special food and wine pairings, Sonoma Valley Delicious offers gourmet-lovers a range of tasty treats and deals throughout the month of January. Plus, you’ll find money off at attractions, boutiques and more, making it easy to splash out for less on a start-the-year getaway. Featuring over 90 hand-selected films screened in intimate venues around the plaza, the Sonoma International Film Festival is a must on any indie movie-lover’s bucket-list. From world cinema to documentaries to short films, this unique 5-day event transforms Sonoma’s plaza into a red carpet wonderland, attracting renowned filmmakers, industry leaders and celebrities alike. For the ultimate barrel tasting experience, look no further than Savor Sonoma, held at 20 different wineries in Kenwood and Glen Ellen, over one weekend. With a mission to take barrel tasting to the next level, sample new releases, mingle with the vintners, and hangout with fellow wine-lovers in intimate tasting rooms. From classics to favorites to hard-to-find blends, enjoy your favorite varietals paired with lunch from local food trucks and delis. There’s nothing quite like this exclusive, behind-the-scenes immersion into the award-winning vineyards, wines, and viticulture communities of Sonoma Valley. Join passionate vintners and growers over one weekend of unique immersion experiences, featuring proprietor-led estate tours, intimate winemaker-led tastings, and much more. A legendary wine event that soon sells out - be sure to book well in advance. One of only five road races on the NASCAR annual schedule, fans from near and far flock to year-round motorsports complex, Sonoma Raceway, for this action-packed event each year. Not a NASCAR fan? With one of the most comprehensive schedules in the country, including Indycar and MotoAmerica Superbike races, it’s well worth checking what’s happening during your travel dates. For a cultural night out with a difference, book seats for Broadway Under the Stars - an award-winning seasonal program of live, outdoor concerts and musicals, held in the beautiful surroundings of Jack London State Park. Set in the open-air ruins of the Kohler & Frohling Winery, this diverse Broadway-inspired program runs from June through September each year, and its memorable shows are the perfect way to top off a day of wine-tasting. 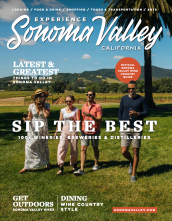 One of America’s ‘Top ten July 4th celebrations’ - as voted by Travel + Leisure Magazine - Sonoma far from disappoints when it comes to honoring the nation’s independence day. The festivities kick-off with a colorful, morning parade, winding its way around the historic plaza; continues with an old-fashioned fare - complete with food, drink, and traditional game booths; and finally ends with a spectacular, 45-minute fireworks show over General Vallejo’s field. July 4th just as it should be. For three full days of luxurious LGBT events surrounded by some of the world’s most renowned vineyards and wineries, Out in the Vineyard’s annual Gay Wine Weekend won’t disappoint. Held over one weekend in July, and led by local gay community insiders, expect world-class cuisine, champagne brunch, pool parties, and more at this LGBT ‘Event of the Year’. The first and only festival in the U.S. dedicated entirely to presenting Classical and Romantic-era chamber music, performed on period instruments, the 2-week Valley of the Moon Music Festival is a true one-of-a-kind. From Mozart to Beethoven to Brahms, hear your favorite 18th and 19th century pieces performed as they would have been originally - more delicately, on woodier pianos and violins and cellos with gut strings. Bringing acclaimed artists to Sonoma for a week each September - to paint, show, and sell their work (for charity) - the Plein Air Festival is a unique experience for art lovers. Watch Sonoma-inspired works come to life in quick-draw competitions and out-and-about in Sonoma; bid on your favorite limited-edition art at a special dinner and gala; and browse previous festival winner creations in the 15th Anniversary Invitational Exhibit. Held over three days at the end of September, Valley of the Moon Vintage Festival has been a beloved Sonoma tradition for more than a century. Founded in 1897, it’s California’s oldest festival - an unmissable celebration of the best of the county’s wine, food, culture, and heritage. From wine-tastings and grape stomps to art exhibits and live music - plus parades, food stalls, kids zone, and more - it’s well worth timing your trip to coincide with this legendary Sonoma event. Delighting visitors for almost 50 years, Sonoma County’s Harvest Fair showcases the best of the region’s bounty - from world-class wines to award-winning beer to celebrated culinary specialties. Taste and buy more than 500 champion wines, peruse the art show, cheer on the teams in the World Championship Grape Stomp, and get hands-on with grown-up harvest activities. Voted the best festival in the county, time your Sonoma weekend with this memorable event for the ultimate local experience. The ultimate way for wine-lovers to toast the start of the holiday season, Heart of Sonoma Valley’s open house sees over 20 wineries in the region throw open their doors - for wine tastings, meet-the-winemaker events, and plenty of wine-inspired gift ideas. This new treasured community tradition features a program of inspiring messages, music and dance, and reflection - before the lighting itself - there’s no better way to mark the start of the holiday season than at Sonoma Plaza Tree Lighting. The Sonoma Plaza becomes lit with 150,000+ twinkling lights to kick off the holidays in Sonoma season. For a holiday lighting with a different festive flavor, head to Cornerstone, where live music, entertainment, and photos with Santa are on offer; as well as the annual lighting of the snowmen, that sit dotted around its gardens. The Sonoma Valley Authors Festival plans to engage, enlighten and entertain its guests during this extraordinary inaugural weekend. The Festival will be open from noon – 8:00PM on Friday, May 4, 2018 and 8:00AM – 5:30PM on Saturday and Sunday, May 5 – 6, 2018. During the course of 3 days, authors from around the world will discuss their books, their lives, and their ideas with an audience of 550 Festival attendees. The authors will reflect a variety of topics and include fiction and non-fiction, biographies, history, politics, adventure, medicine, and science. Also participating in the Festival will be thought leaders who are transforming lives through medicine, technology, communication and philanthropy. The Festival will feature 6 keynote speakers and a choice of 24 breakout sessions.